Big Tooth is a very good yielder bred by combining the genetics of an Afghan, a Hawaiian Sativa and a Nepalese variety. The outcome is truly mind-boggling in regards to both the harvest and the effect of the product. In an indoor setup it is possible to end up with 900g/m² and outdoors even 1kg per plant - and that after only roughly 9 weeks of flowering. Big Tooth is based on three varieties without a name - the genetic composition is a blend of an Afghan, a Hawaiian Sativa and a Nepalese variety. The resulting strain is truly amazing in regards to both the effect of the product and the productivity. Strain Hunters did not choose the name Big Tooth unfounded - this 60% Indica/40% Sativa hybrid has the potential to yield up to 900g/m² after 8-9 weeks of flowering in an indoor setup when grown under a 1000W lamp. 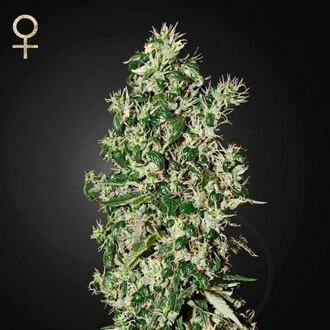 Outdoors, where she requires one more week to reach full maturity, it is possible to harvest up to 1kg of flower clusters per plant. Big Tooth has a good resistance to pests and grows up to a medium tall plant with an internodal distance averaging between 8-12cm. She develops incredibly large elongated buds in the form of a fox tail, dusted with crystals and riddled with an abundance of long pistils and tiny leafs. The smell of the ripe plant and cured buds reminds of hot spices and chili peppers, but with a hint of something chemical. Smoking Big Tooth weed fills the mouth with the flavor of spices and wood, seasoned with herbal and floral notes. Big Tooth is perfectly suited to crank up your appetite and acts as an anti-depressant although the high comes in alternating waves - it comes on instantly and is intense and complex, very balanced between body and mind, with waves of energy flowing through your body and brain and yet with a relaxing and numbing effect on the body.